E4TheFuture 1.9 Million Energy Efficiency Jobs in U.S.
1.9 Million Energy Efficiency Jobs in U.S.
December, 2016 — Report by Environmental Entrepreneurs and E4TheFuture. 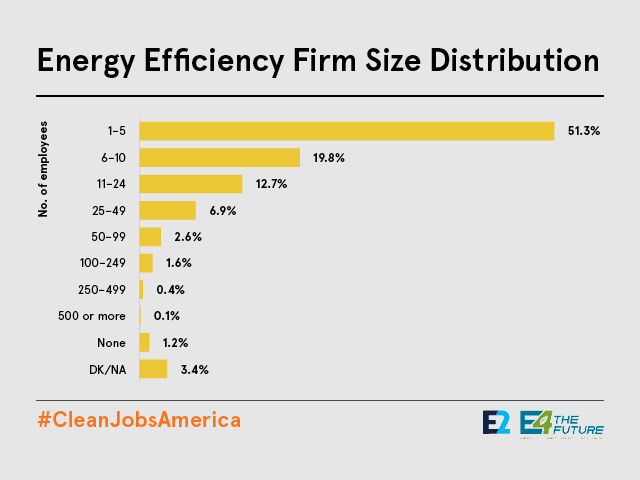 “Energy Efficiency Jobs in America” analysis finds that energy efficiency is one of the nation’s biggest job sectors, employing more than 1.9 million Americans. Small business employs the vast majority of workers. The report includes detailed state fact sheets and breakdowns of energy efficiency jobs to the city, county, legislative and congressional district level – data not available previously. It is based on data from the U.S. Bureau of Labor Statistics and the U.S. Department of Energy, as well as a comprehensive survey of tens of thousands of businesses across the country.